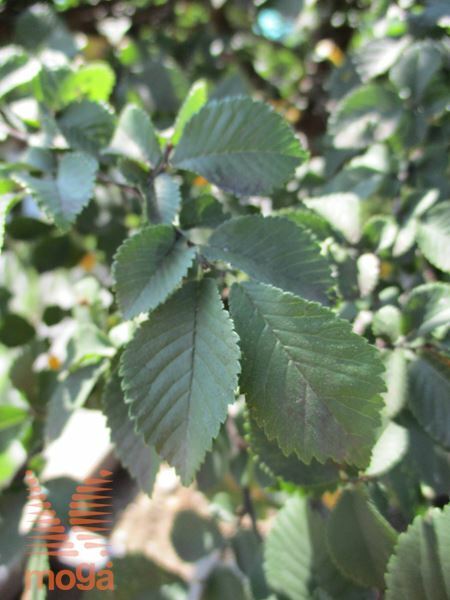 Ulmus minor Description European field elm Description Large, upright, broad, fast growing deciduous tree (H 20-35 m, W 18-25 m). Crown broad, ovate to fen-shaped, at maturity dome-shaped. Bark on young shoots brown, often with corky wings; old bark red-brown to brown. Branches widely spreading. Leaves vary in shape, simple, broadly ovate to almost round (5-10 cm), with a doubly serrate margin, slightly glossy, dark green, lighter underneath, eventually hairy; autumn colour yellow. Flowers not remarkable, brown-red. Flowering period: March-April. Fruits flattened, round (1,5 cm), brown. Requires moderately dry to moderately moist, deep, fertile, loose soils, also on lime. Easily withstands heat and occasional drought, occasional flooding, urban conditions and wind.